Q: Why did you start running? A: A co-worker who was a seasoned runner was putting together a team for a corporate challenge race and said I should do it. I did and have been running pretty much ever since. 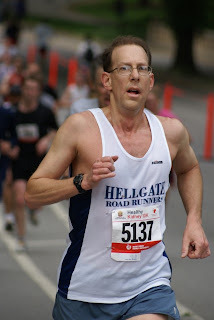 Q: When did you join the Hellgate Road Runners? Q: Do you like to run in the morning or evening? A: Evening but will do mornings to accommodate other evening activities. Q: In a typical week how many miles do you run? A: Generally not although I am attempting a biathlon. Q: What is your favorite running shoe? How many pairs do you have? A: I run in the Asics 2100 series (currently 2120) and Mizuno Wave Precision. I have more pairs lying around than I care to count! Q: Have you ever had any running injuries? Q: How did you overcome the injury? A: Cortisone is a beautiful thing! Q: Do you subscribe to Runners World Magazine? If so, do you like it? A: Yes I subscribe and I hate it. I bought the subscription from my nephew. Q: Do you have any habits or rituals you do before working out? A: None to speak of. At best I am an inconsistent stretcher! Q: After a workout, what do you do with your sweaty running gear? A: Hang it on a door knob in my apartment to dry and then wash it with my weekly laundry. Q: What race or races are you looking forward to this year? A: NYC Marathon and Fairfield, Queens, and Staten Island 1/2s. Q: Do you have a sports hero or idol? Who is it? A: The Spaceman, Bill Lee. For those who are not baseball fans, Bill Lee was a Red Sox pitcher in the 70's. He was a lefty (like me) who threw an amazing arcing curveball (the eephus) at a very slow rate of speed. He was a little off-kilter as well, hence the nickname. Warren Zevon also wrote a song about him.He was a favorite of mine growing up. Q: What dream race or races would you like to do in your lifetime? A: I would like to run a marathon somewhere in Europe, perhaps Ireland, Greece, or Germany. Q: You recently ran the Boston Marathon. Please tell us about your experience. A: I truly felt humbled by the distance for the first time in my career (8 marathons). I last ran Boston in 1998 and those 10 years really showed themselves this time around. I started strong and crashed early! I had a lot of fun but my time was far from what I hoped to run. Given the tough weather conditions and the difficult course, I shook off my disappointment quickly and I am glad I ran this race again. I grew up in the Boston area and love running that course. Q: Describe your favorite, or most memorable, running experience. A: Qualifying for Boston in 1997 is a favorite memory as are the many times I have run a race in Westchester called the Leatherman's Loop, a challenging 10K cross country run through the mud and rivers of Pound Ridge Reservation in Katonah. Q: In 10 words or less, please tell us why you run. A: I find great joy and energy in running.